The health of Usain Bolt has been a question as the showman enters his final Olympics nursing a sore hamstring. His parents paid him a brief visit in the athletes village and insisted Friday he's ready to run and defend his gold medals. Wellesley and Jennifer Bolt both inquired about their son's health in their Thursday night visit with the sprinter. Bolt pulled out of his national championships last month because of the hamstring injury, but has insisted he's fine to compete in Brazil. "He said 'Mom, if I wasn't ready, I wouldn't be here because I'm not into the losing thing. I'm ready,'" said Jennifer Bolt. Bolt is trying to win the 100, 200 and 4x100 relay — just like the last two Olympics — to close his career with nine gold medals. 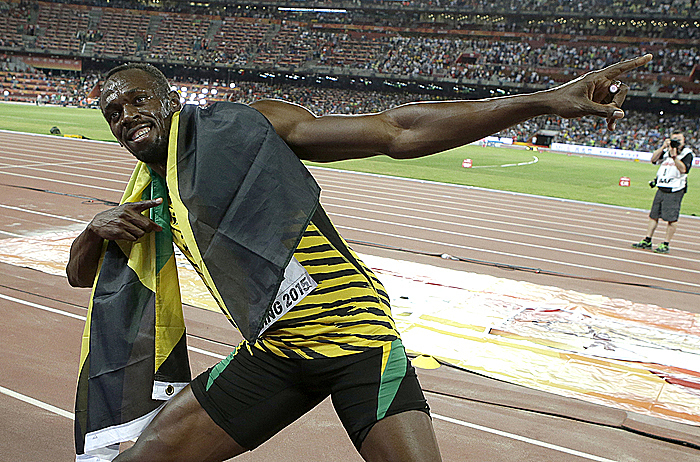 The 100-meter final is Sunday and Bolt races in his first heat the day before. The Bolts spoke to a small group of reporters during a news conference, giving anecdotes from Bolt's childhood and discussing his rise into a global superstar. Although he was born roughly 10 days past his due date — "the only time in his life he was slow," she said — he's been fast ever since. She recognized he might be special just three weeks after his birth when he nearly fell off a bed and she noticed him trying to push himself up. "I thought 'What kind of a child is this? Three weeks old and he's pushing!'" she said. He was off and running from there, just like both of his parents. He once had to sprint home from school to collect his forgotten lunch and by 10, he could beat his mother in a race. Two years later, they knew for certain they had an athlete on their hands. "At the age of 12, being in primary school, he started to compete in school sports and he was always on top and he was always beating his classmates," she recalled. "From then, we noticed he would be a great athlete." He may have inherited his speed from his parents — and father Wellesley took credit Friday for Bolt's dance moves — but the sprinter is a far bigger entertainer. The Bolts were soft-spoken and almost shy, although they said they appreciated the opportunity to tell reporters about their son. They still live in the same modest one-story home in Trelawney, Jamaica, and wouldn't dream of moving anywhere else. Moving would require making new friends and leaving behind what they know. Besides, life in Trelawney has improved significantly since Bolt's first gold medals in the 2008 Beijing Olympics. Since their son became a star, Trelawney now has running water, a paved road, refurbished clinics, health centers and schools and a new playground for kids. Wellesley still reports for work at the village shop, where he sells as much as he gives away. "It's something to occupy my time so I don't get lazy," he said. "As parents, we are proud of him, but we don't think it is fair of us to be acting over the head of the rest of the community. So I operate the shop mainly to give away what we have." They also enjoy Trelawney because Bolt can move freely through the community. Although he draws a crowd everywhere he goes, they said their son is happy at home. Once he's retired, they look forward to the crowds letting him be. "He will be able to move around as he wants," Jennifer said. "People always want to get close to him, not to hurt him, but just get close to him." She said she has seen no change in her son as his stardom grows. From his debut in the 2002 junior world championships, Jennifer insisted Bolt is still the good child who listens to his parents. The one thing that did grow, though, was Bolt's love of the spotlight. Although Wellesley characterized him as "playful at home," it wasn't until Bolt took the world stage in Beijing that he realized how much entertainment he could give a crowd. "In Beijing, he started doing all these things and realized people really liked it," Wellesley said. "That's when he became an entertainer." Bolt, who turns 30 on Aug. 21, has been adamant these will be his final Olympics. His parents believe him and think he's determined to go out a winner. When he's through competing, they know exactly what they want him to do. "I would like him to be an ambassador to track and field because he brings fun to the sport," Jennifer said. "After he leaves, you don't know who will take over his role. Without him, it would be really boring."